This article is part of our How To Yanado series. 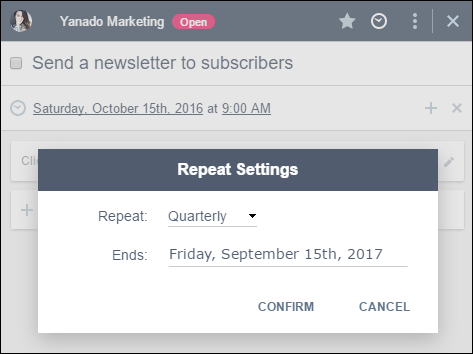 You might have a weekly newsletter to send to your subscribers every first of the month, or you want to make sure you don’t forget about that weekly planning meeting you have with your team. Or is it that you have a status report to create and send to the top management every month? While you might be part of a development team and you’re deploying new features on the production every Friday. So what’s the pattern in here? It’s that all these tasks are likely one of those that you most often write in your to-do lists or project management tools. Those are likely the tasks you repeat on a daily, weekly and monthly basis, or that are part of the streamlined process of your team. 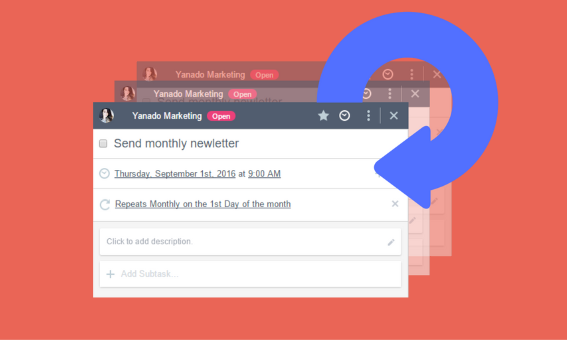 What would be of help is to have a feature in your project management tool that will save you the time you spend on creating these tasks – a recurring tasks feature! 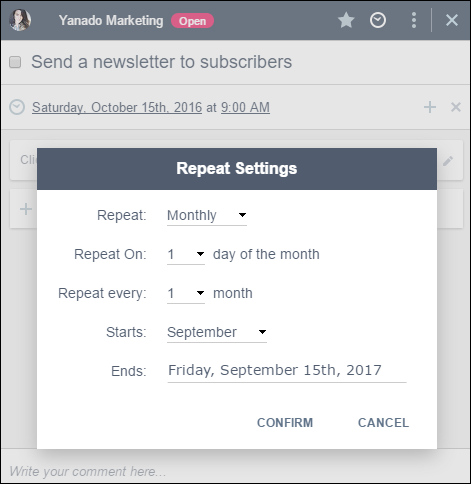 This feature surely will not get the tasks done instead of you, though it will create these repeating tasks for you – automatically. 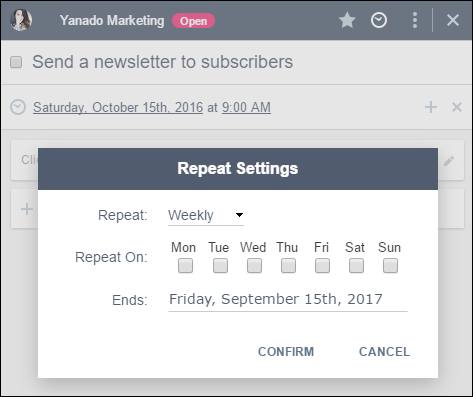 What’s even better is that with the fresh new improvements we’ve added, you will now be able to use Recurring Tasks feature in Yanado! You do this as you create a new task or open the existing one and then click on the “Set to Repeat” inside the Task options. 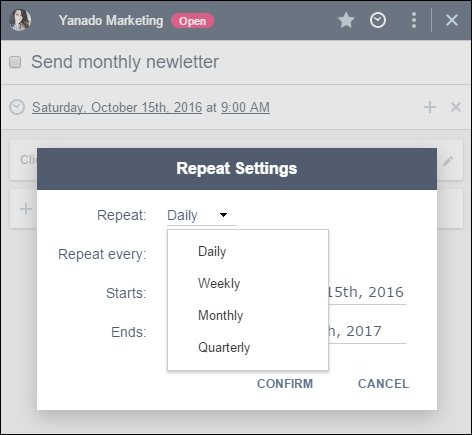 In the window that appears, you’ll find the Repeating Settings, where you can set the periods of time at which you want the task to be repeated. There are several options you can choose from. Set the starting date (which represents the day from which the task will continue to be repeated). So, if you set the task to be repeated every 5 days, starting from 1st of September and you set the ending date to be 30st of September, that means the task will be set to repeat every 5 days till the 30th of September. So, if you set Thursday to be the day at which the task will be repeated, and you set the end date to be 30th of September, that means the task will be set to repeat every Thursday (starting from the day you set it) until the 30th of September. So, for example, if you set the 5th of every month, starting month to be the September, and you set the ending date to be 31st of December, that means the task will be set to repeat on 5th of every next month, starting from September till the 31st of December. So if you set the task to be repeated on quarterly basis (starting from the current date of the task e.g 1st of September 2016. ), and you set the ending date to be 31st of December 2017., that means the task will be set to repeat every next quarter of the year during that time (first next date, in this case, will be 1st of November 2016.) till the 31st of December 2017. The due date of the task will be the date at which you set the task to be repeated.